Trousers and zip-up knee boots are two fashion evils that can reduce me to a crumbling shell of my former self. Being curvy and only 5'1" makes shopping for anything quite tortuous, but I'm almost at the point where I avoid looking for trousers entirely, wearing the same worn-out ones I already own over and over again, or simply defaulting to dresses and skirts. It's a shame because I adore suiting and love the idea of wearing trousers to work. When you find a pair that's right, they're so right, but when they're wrong, I feel like crawling into a hole under my desk and wishing the day to start over. I can come to terms with hemming everything I'll ever purchase and occasionally having to sacrifice the look of a silhouette so that I don't trip over. However, the constant "big on the waistband but too tight on the thighs" fit struggle that I seem to find across both designer and high-street brands is enough to make me give up on trousers forever. A great portion of my job is to ensure that you, dear reader, don't get stuck in this terrible shopping or styling rut. So I had to face my fear for the greater good. I spent four sweaty, stressful and frankly quite depressing hours trying on every single pair of kecks I could get my hands on in order to find the best of the bunch. I went to luxury and high-street retailers, spoke to some staff for advice and reached out to my other curvaceous friends in the fashion industry for help. I also experimented with a range of silhouettes just in case I'd been overlooking something magical this whole time. Anna Cascarina, a mid-sized Instagram influencer, tells me, "I'm a size 14–16 bottom, and buying trousers when you're bigger than a size 12 is often a struggle—especially if you're after a certain silhouette. We don't want to wear cropped wide-leg trousers all of the time!" Many of the pairs I tried looked awful (I won't share those pictures with you—delete! ), but I think I have started to decipher which labels, cuts, fabrics and shops will be kindest to your thighs. For context, I'm a size 10–12 in most items, but always a 12+ in trousers. I realise this doesn't put me in the plus-sized category and that shopping for pants in larger sizes becomes an even harder task thanks to the poor selection on offer. What I do hope is that there are enough tips below to help anyone on a mission for perfect-fit pants. This is the failsafe, super-classic option every woman—no matter her size or figure—should have in her armoury. However, it has to be said that a well-cut pair of high-waisted, wide-leg trousers can really do wonderful things if you've got a small waist and bigger bottom/thighs. You need the trousers to fall from your hips without tautened horizontal lines cropping up across your thighs. If that's happening, then your trousers are too tight. These were some of the most elegant wide-leg pants I tried on during my experiment. I already had an inkling Theory would work well for me given its heritage in tailoring and the fact that it caters so well to the working woman. Theory's wide-leg trousers ticked all the boxes and were rendered in a slimming, comfortable crepe fabric. I realise their hanger appeal is minimal, but one does need hardworking, long-lasting items in a capsule wardrobe. I'd recommend wearing a fitted top or sweater so that you're balancing out the fullness of the trouser legs. Heels work with these, but so do sneaks or flats (although, personally, that's not my jam). This particular style goes up to a 14 in Selfridges, but many of Theory's trousers go up to a 16. Peg trousers often have some volume around the thighs (tick) and are often designed with a higher waist that's also adjustable (tick), which helps keep everything neatly balanced. Topshop is particularly good at this trouser style, and after I hesitated to even put them on, I was shocked to find that these checked pants were very slimming. Plaid can often be rather unflattering on my legs, so it was nice to feel that my curvy body doesn't have to be restricted to plain, dark trousers only. This really proves a point that I mention further down in this piece: Although there are some rules worth following, it's also important to dare yourself to experiment with some wildcard options. You might be pleasantly surprised. Again, I'd suggest that any trouser with a higher rise looks best with a slimmer-fitting top: "Personally, I find I need to show a sliver of ankle for trousers to look good on me. 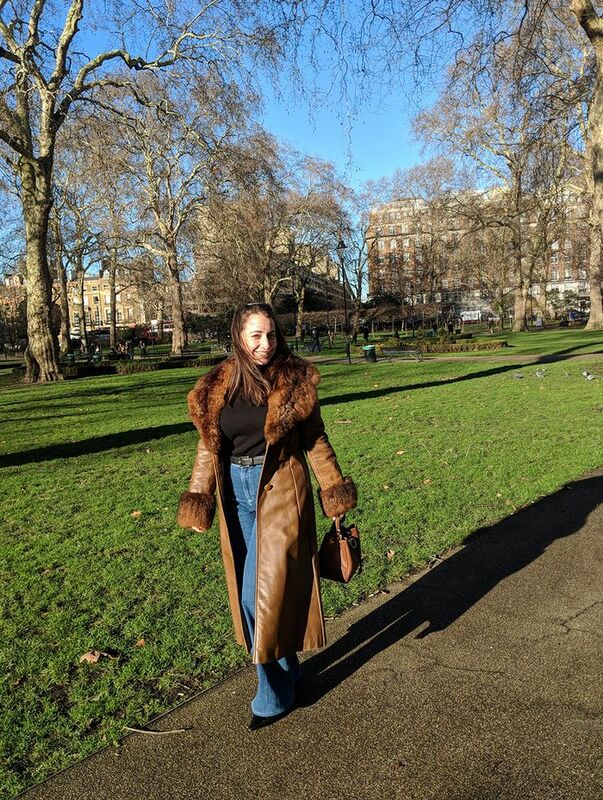 A cropped length helps make my short legs look more in proportion with my body," says Maxine Eggenberger, Who What Wear UK fashion contributor. Maxine and I have had many conversations about the fashion plight of being curvy, and she's convinced a simple shoe trick will help: "Strangely, I feel like the effect is enhanced with an ankle-strap shoe." These appear to go up to a size 18 online, but it looks that particular size is sold out right now. Keep checking back often, as Topshop usually has a round of restocks. Of my fairly limited trouser options at home, the majority are culottes. Their high-waisted and A-line cut fall lower than mid-calf so that they're as leg-lengthening as can be. In the winter, I'll wear them with long boots for a seamless effect, and in the summer, they'll work with everything from flat slides to strappy heels. This is a trouser style that works well in different weight fabrics also—such as these silky palazzo-style pants from Valentino. The cut can be just as easy to navigate in a thicker herringbone tweed or cotton gabardine too. These particular culottes would look far better with a little white top or camisole than they do with my wintry black blouse, but they ticked all of the boxes, felt truly trendy and are worthy of a splurge (should you fancy it). These trousers go up to an Italian size 48, which approximately equates to a 16–18 UK. If you've got short legs like me, you need your trousers to be high-waisted—no arguments. Sounds easy, but locating a pair that doesn't gape at the back appears to be as complicated as Brexit. That's when it's imperative to keep on trying different brands to find your perfect match. I had the most luck in every single trouser silhouette at Me+Em. I've spoken to the brand's PR team for some time about its in-house trouser development. I learned that the whole design process takes much longer than others and uses multiple fit models of different sizes to give them really rigorous testing. I was hoping I'd find a pair here, and I did! The lovely in-store staff are equipped with great advice on fit and sizing. They also have the persuasive skills to get you to test different styles (they literally brought me every single available trouser to try on). The majority of the brand's cuts do sit on your waist—whether wide-leg, cigarette or culotte. These go up to a size 16. If you're straying from the above tried-and-tested silhouettes (wide-leg, peg and culottes), it's highly likely you'll have to opt for a different size. Any trousers that are cut to a skinny or cigarette-leg fit always appear to suddenly shrink upon sight. I had success in my usual size at Karen Millen, but these trousers would have perhaps been even better one size up. The British brand is a secret source when it comes to flattering patterns. I've often thought its dresses and coats are really good fits, but now I'm intrigued by the office-ready pants too. I'll always advocate for sizing to be standardised in the fashion industry (how nice would it be to really know what your size is and just pick it up in any store without a fuss or risk of failure? ), but that will probably not happen in my lifetime. That being said, it's important to just use these numbers as a guide of what to reach for first—not to be emotionally attached to. If you find a pair of beautiful trousers that look incredible on you but the label says they're two sizes bigger than your usual size, pick it up. Who cares? Who even knows? I won't name names, but I spent a great deal of time exploring a range of French contemporary brands just to see if I was going mad. Everything on these rails maxed out at a French size 38 (UK 10), and even that—as many will know from experience—is cut small. I had a bit of luck with some luxury French brands (Chloé had some nice options, for example), but overall, it was really disappointing to see such a lack of goods for anyone with a bit of junk in their trunk. At this stage in shopping hell, I made a mental note to not revisit these brands in the future—no point in creating unnecessary hurt. However, if you work for a mid-price-point French label and want to challenge me on this, please get in touch. It's @hannahalmassi on Instagram. One thing I did discover on my travels was that when you've got a curve to your stomach, it's best to opt for styles that have front pockets, side pockets, zip-fronts or front-detailing like pleats or an interesting D-ring fastening. Any trousers that I tried on with absolutely no detail at the front ended up making me look like I had a bigger tummy than I do. Eggenberger also has some sage advice for your behind: "Where I can, I always invest in styles with back pockets. Rather than detracting from my bum, I find they help sculpt it." During my travels, I developed a few favourites (Topshop being the best at the moment), but I've also had successes in the past at Uterqüe and Marks and Spencer. My fashion friends have some more affordable stores that win in this department. "My go-to stores are & Other Stories, Arket and COS for their simple aesthetics and core silhouettes, but I also find ASOS is brilliant for its curve and plus ranges too," says Cascarina. I'd add that Karen Millen, L.K.Bennett and Reiss are often worth a try if you've got a little more cash to play with and are looking for more classic silhouettes instead of trend-driven styles. These are available up to a size 18 online. You'll definitely need to get them taken up if you're short like me. On the day I went climbing Mount Trouserest, I wore simple underwear that didn't dig in anywhere or would create any unsightly lines. I also took a pair of heels with me in a bag, and tried on different tops and jumpers if store staff offered them to me. It's good to see how a pair of trousers would work differently with what's potentially lying in your own closet. I also wore leggings to go on this shopping mission, as they're so easy to take on and off (it sounds obvious, but it's easy to get flustered, overheat and just sack it all off). Alexander McQueen trousers are impeccably tailored, but they are very expensive. It's best to invest in this pair that's in the sale. Max Mara's many lines all make well-cut trousers, particularly in wide-leg silhouettes. Everyone looks good in a matching top-and-trouser combo. Stella is another designer known for her flattering trousers. These come in a shorter length (and size 6-24), so great for petite girls. Love the colour of these. These are actually tailored chef trousers that fashion girls are now wearing. They sit tightly on your waist, so they're better for days where you're not sat down at a desk. Next up, how to do a decent wardrobe clear out.